To vote or not to vote — that is the question for Occupy Wall Street protesters and for Americans sympathetic to the Occupy movement taking place in cities throughout the US. For many of those who intend to vote, it means casting a ballot for Democratic candidates, including President Obama. For those who don’t plan to vote at all, the outcome of elections is irrelevant, because nothing will change under the current political system. Are these the only two choices? The US is in a crisis, a political holding pattern in which Democratic presidents and party leaders keep adopting more and more Republican agenda while Republican politicians sink deeper into irrationality and borderline fascism. The crisis won’t be solved by intoning “We must vote to reelect Obama and other Dems because Republicans will be worse” or by denial that voting can have any effect on the future. Are we locked into a rightward-sliding two-party paradigm for the rest of history? What if millions of voters began to think outside of the two parties? (1) Non-voting and anti-voting: Nonvoters have no effect on the political landscape. Occupy activists and others who have ruled out voting as a way to effect change ensure that they’ll have no collective influence on who gets elected or the policies of the candidates who get elected. (2) Zombie voting: mindless votes for incumbents and party lines, regardless of a candidate’s platform, background, and qualifications. For such voters, Election Day is an empty but necessary ritual undeserving of critical thought. (3) The mistaken belief among liberals, progressives, antiwar voters, and others that the Democratic Party offers change, that things will get better if we just keep voting to elect Democrats, or that we have to keep voting for Dems because they’re not as awful as the GOP. By justifying votes for a party that long ago abandoned its “party of the people” principles, progressive, antiwar, environmentally-minded, and pro-labor voters have participated in their own political demise. We are long past the point at which lesser-of-two-evils voting has turned into self-defeat. The Democratic Party expects progressives to continue voting for a party hostile to their ideals on the assumption that they have no one else to vote for and that a Republican victory would be far worse. When genuine progressives, like Rep. Dennis Kucinich, run for the Democratic nomination, their loss is assured and their campaigns ultimately serve to herd supporters into voting for a nominee that rejects nearly everything they stand for. As Les Leopold argues (“Don’t ‘Occupy the Democratic Party‘ — Four Lessons From the Populist Movement,” AlterNet, Dec. 13,, there is no hope for a rehabilitation of the Democratic Party. If anything, the Democratic Party is likely to jump even further to the right in the wake of the Supreme Court’s 2010 Citizens United ruling, which struck down limits on corporate advertising for favored candidates, increasing the influence of business elites over both major parties. Republicans are already trying to discredit the Occupy movement. We can predict that pro-GOP ads will slander the Occupy movement, and that, based on their usual tendency to retreat when challenged by the GOP, Obama and Dem leaders will dissociate themselves from the protesters and their demands. If the 2012 presidential race is limited to D vs. R, the grievances and demands of the Occupiers will be banished to the margins by late spring 2012. Street protest can be successful at capturing public attention, as demonstrations have proved throughout history. But it can be easy to mistake the vigor of protest movements, numbers of participants, and public sympathy with real success in changing the world. The protests against the Iraq War during the last decade collapsed after Barack Obama’s inauguration, because so many Democrats, believing they had just elected a progressive antiwar president, decided that protest was no longer necessary — just when we needed it most. 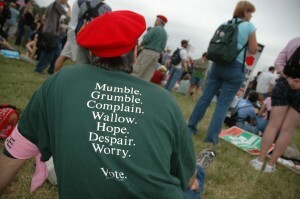 What will happen in 2012 when pro-Dem unions and liberal groups and other Obama supporters are forced to decide whether to continue participating in Occupy protests against the Administration’s policies or help get President Obama reelected? Organizations like MoveOn.org and Van Jones’ American Dream are already trying to coopt the Occupy movement and spin it into “Reelect Obama.” These groups will be reluctant to join the angry demonstrations that many of us hope to see outside the 2012 Democratic National Convention in Charlotte, North Carolina (as well as the Republican Convention, of course). Participants in protest movements often espouse a variety of sometimes inconsistent ideals and tend to offer very general complaints and ideas for change. Demanding economic justice or an end to a war isn’t a program for systematic change. The Vietnam War protests focused public opposition to the war and may have hastened the pullout of US troops. In the end, however, the protests didn’t overturn the military-industrial complex or imperial culture of Washington, DC. Subsequent administrations, beginning with Jimmy Carter, maintained the pattern of US intervention in countries around the world. In some cases, those in power simply ignore protest. The mass rallies throughout the US against President George W. Bush’s order to invade Iraq in 2003 had no effect at all. The Occupy movement must continue. We should look forward to its survival through the winter and renewed vitality when spring 2012 rolls around. But we must also find ways to make systematic changes and rebuild the political culture of the US so that wars of aggression, capitalist depredation, ecological irresponsibility (exhibited by the Obama Administration in early December during the UN meeting in Durban, South Africa, on climate change), assaults on the US Constitution, and other evils don’t keep repeating every few years. In other words, we must replace people who are in power. The good news is that more and more Occupiers are showing interest in electoral action outside of the two Titanic parties. They’ve begun to embrace the vote as a strategy for challenging the corporate corruption and the erosion of democracy, in efforts like Occupy the Ballot. Occupy Cincinnati demonstrators are already working to establish their own party. Carl Mayer, public defender and long-time supporter of Ralph Nader and the Green Party, recently spoke before Occupy Wall Street in Zuccotti Park and expressed “his hopes of the OWS movement’s becoming a viable third party in the future“. On December 13, former Salt Lake City Mayor Rocky Anderson launched a presidential campaign, via his newly founded Justice Party. Alternative parties have been responsible for introducing urgent changes, whether the parties themselves have succeeded (the anti-slavery Republican Party in the mid 1800s) or failed. The list of reforms introduced by third parties and initially rejected by the political establishment includes abolition of slavery, women’s suffrage, the eight-hour day and other workers’ rights and protections, and civil rights for Blacks. If you’re worried that the US is drifting into a new Robber Baron Era, remember that the Populist and Progressive parties helped end the last one in the late 19th and early 20th centuries. Who will represent the important ideas on the electoral stage in the 21st century? The Green Party holds promise as an established national party, having laid a foundation for willing Occupy candidates to run for public office. In many states, Greens have accomplished the difficult task of achieving ballot status, overcoming prohibitive rules enacted by Democratic and Republican politicians to hinder alternative parties and candidates. Greens have spent more than two decades building party infrastructure and gaining campaign experience. The demands of Occupy protesters are clearly reflected in the Green Party’s platform and refusal to accept corporate checks. In New York, the Green Party achieved major-party status through Howie Hawkins’ campaign for governor in 2010, fulfilling the state’s stringent requirements and earning Greens their place on the 2012 ballot. New York Greens have been active in Occupy Wall Street since the protests began in September. In the 2011 general election, Cheri Honkala, a long-time housing activist and founder of the Kensington Welfare Rights Union, ran for Sheriff of Philadelphia as a Green on an anti-eviction platform. Ms. Honkala spoke publicly at Occupy events about her pledge not to cooperate, if elected, with banks attempting to foreclose on Philadelphians’ homes. Whether Occupy activists decide to go Green or some other partisan route, they have the potential to lead a national voters’ rebellion against the Titanic parties and trigger a sorely need seismic shift in US politics. The day a few non-corporate-money Occupy candidates are elected to Congress is the day Democratic and Republican politicians are no longer each others’ sole competition. The public debate on any given issue would open up to new ideas outside of the narrow D vs. R spectrum of policies and legislation approved by Wall Street, the oil companies, arms manufacturers, insurance companies, and other corporate interests. There is no such thing as two-party democracy. Two-party elections are a single step removed from one-party states like the Soviet Union and China. At the heart of the voters’ rebellion is the right to choose whichever candidates best represent one’s own interests and ideals, without being told our choice is restricted to Big Mac vs. Whopper. Refusing to vote and insisting on loyalty to Democrats will have the same effect — a future limited to the parties of war and Wall Street. Thanks to the momentum of the Occupy movement, 2012 gives us an opportunity to save the US from the demise of our republic, collapse of the middle class, and descent into terrain that would be familiar to Benito Mussolini in the 1920s. Given the increasing entrenchment of corporate-money politics in the age of Citizens United and accelerated redistribution of wealth and power to the one percent, this opportunity might be our last. Scott McLarty is media coordinator for the Green Party of the United States and for the DC Statehood Green Party. He lives in Washington, DC. 4 Comments on "The Occupy Movement Must Also Become a Voters’ Rebellion"
The OWS is stuck in a pattern of repeated behaviors and is unable to assume responsibility or provide leadership to the people who accept its critique of American society and government. It is all well and good to project oneself as an Old Testament prophet condemning the sins of the world, but the storyline of the OT prophets resulted in condemnation of the people and destruction of the same prophets, not deliverance from evil. OWS wants to stand apart from the world, rather than being of the world. In so doing, they leave the tasks of Caesar to Caesar and they continue with their prophetic condemnations. It is an indication of the real lack of engagement in the political process that so many OWS activists accept their apolitical methodology as sufficient for changing the world. Just too many documentaries on the Civil Rights movement and the anti-war movement in high school. They missed the issue of how support was organized at the grass roots level. They missed the point of how the politics of the era had Abe Ribicoff publicly scolding Mayor Daley (Papa) at the Democratic Convention. Trying to circumvent electoral politics is self-defeating and just gives the Democrats control of the character of the change that will result from peoples’ discontent. Building an opposition Green Party means that we structure the support that is out there, formulate sound, feasible policies and engage toe-to-toe with the Titantic parties. Politics will not be substantively addressed by a mixture of a boy scout jamboree and a peoples’ park replay. Street theatre is no substitute for the dirt of electoral politics or the nitty gritty of local organizing. See, even those of us who agree with the critique are not prepared to support OWS when the campsites are closed. That speaks to the inherent limitation of repeating history to address the problems of today. The isolation of OCCUPY sank in to me as I saw the small response in San Francisco that has a long history of mass struggles and a large social base hit by foreclosures, and yet a small OSF that was effectively isolated. OSF went as far as to reject an alternative site offered by the city where they could have a stable base for expansion. They’d rather be outlaws then effective. Occupy Oakland managed to alienate the most powerful and influential industrial union (ILWU) in the region, because of its own insistence on militancy over base-building. Occupy Berkeley is content to control land on campus with 100 campers, while the University budget gets cut and tuition is raised. The tactic has been raised to a strategy with no politics that are focused and organized. As a result the battles with police over the campsite becomes the focal point of day-to-day struggles. But it means nothing when the 99% remain on the sidelines. WHEN ANYTHING CAN BE CALLED A GENERAL STRIKE, THEN NOTHING IS A GENERAL STIRKE. The “narrative” has imprisoned the OWS rather than the real politics that will address the issues of people arising due to the recession and the investment bankers’ poisoning the well of the international economy. It is presented in election campaigns by Green candidates. A very good response to Scott’s good piece. I agree with all your comments. Greens and the Green Party are focusing too much on Occupy to the detriment of the Green Party. I’m not convinced that Occupy was not originally or at its core a contrivance of the democratic party or that it won’t be entirely by the 2012 elections. First the media was focused obsessively on the tea party. Now, it’s on Occupy. They know that neither of these groups can get anywhere without them. They switched their obsession to Occupy, and the media now says the tea party will go nowhere. When they stop their obsession with Occupy, they will say the same thing about them. And what controls the media doing that? Their democrat and republican controllers. What it does is deflect attention from the Green Party. Greens should not be helping in that process. It’s very possible that without the help of Greens, Occupy would not be what it is, same as with other democratic party events. Greens and the Green Party keep trying to be a part of the trendy events out there instead of drawing people to the Green Party which in time will make it the place to be. All these other efforts lead to nothing. The Green Party has the potential and has already lead to many changes. But in being around a long time, it has gotten more pummeling from the media. When a child is marginalized, beaten, suppressed and told it is dumb, stupid, worthless, delinquent every day, there are real psychological negative consequences, one of them being an inferiority complex and not being sure of themselves. That’s the condition the Green Party is in. It doesn’t stand up for itself well, and so many Greens glom onto any passing thing instead of using that time and energy to help the Green Party advance. In the collective it is an unbelievable negative detractor to the Green Party and sends a big negative message of little faith of Greens in their own party. That’s not the way to success. Yes, Martin, an excellent analysis. Speak more about how the Green Party can take the OWS movement to the electoral level, especially in the Presidential race of 2012. How do we actually do it? We need to be careful about stuff like this. OWS is *highly* suspect to outside groups looking to co-opt them. We need to earn their vote, not pander to them. I thought Scott’s piece was a well-balanced comment on the issue.